I’ve been exhausted lately. Not the kind of exhausted where you need a good night’s sleep—really, completely, totally exhausted nearly all the time, despite however much sleep I may get. And it’s reached critical mass in the last couple of weeks, because my exercise has begun to suffer from the feeling. Usually running energizes me, but lately I feel sluggish while I run–as if the air is more like water and I have to struggle through it—and I am completely worn out to the point of feeling sick afterwards. In the meantime, I’ve realized I have to take it easy. For a while I thought I was just fending off an illness, and I was hoping I could give my energy and my immune system a boost by exercising. But that’s just not the case right now; I need to focus on helping myself retain the energy I have for the truly essential functions of my life. Taking a week or two off won’t kill me. (In fact, I have noticed before that taking a week or two off may give my muscles the rest they need to make further gains when I resume exercise.) I’d rather be exercising, but that’s life. This is a long-term—life-long, in fact—plan for taking care of myself, so self-care has to be the first priority, even if paradoxically it means not exercising for a short while. The level of exhaustion I have been feeling, on top of a busy workweek, kept me from grocery shopping this past week. By the time I got home each day, I felt completely battered. I wanted to go straight to bed. My husband helped out out by assisting me in making simple meals (for which we already had the ingredients), and then he led the way on the clean-up as well. I’ve been sleeping (or at least in bed with the light off) for 9-10 hours a night. I wake up tired. I struggle to stay awake at work. I yearn for bed all day long. I feel listless. By the time I left work on Valentine’s Day, I was on the edge of tears over my extreme exhaustion. Then, lost in thought, I missed my new exit on the way home (my usual exit is now blocked from road construction), and I got stuck in rush-hour traffic trying to forge a new path home. By the time I picked up my husband from his workplace, I was entirely wiped out. He took over driving, dropped me off at our apartment, and went to the grocery store. He picked up the cheeses for our starter course and a couple of ingredients to make a main course. Meanwhile, at home, I did manage to summon the energy to make a vanilla cake mix (gluten-free, egg-free, soy-free, etc.) in heart-shaped pans and cupcake pans as the base for our dessert. When Dan returned home, he pulled me to him gently and held me while I cried a bit over my frustration with feeling so bad. Then he made the main dish while I chopped up the cheese for our first course. We sat down to eat together and talked through our days. Dan gave me his Valentine’s gift for me, which was a mani/pedi gift certificate for a spa I have wanted to try, a gourmet chocolate bar I’ve been eyeing, and a hysterical MadLib about how awesome I am and how much he loves me. Sometimes the best recipes come out of mistakes. And sometimes the truest way to recognize love is the little things, like a person who doesn’t know his way around the kitchen too well moving outside his comfort zone to shop for and make the main course—and then clean up from it–without complaining a bit, when he knows you don’t feel good. Gluten-free, dairy-free, soy-free, egg-free. Serves 2-4, depending on serving sizes. Put a large pot of salted water on to boil. Prep the ingredients. Put the garlic through the oil in the food processor. Process to a reasonably smooth paste. Taste and add additional amounts of ingredients as desired. When the water is boiling, boil the pasta. Either add the broccoli for the last four minutes, or steam it for 4-5 minutes in a separate pot. 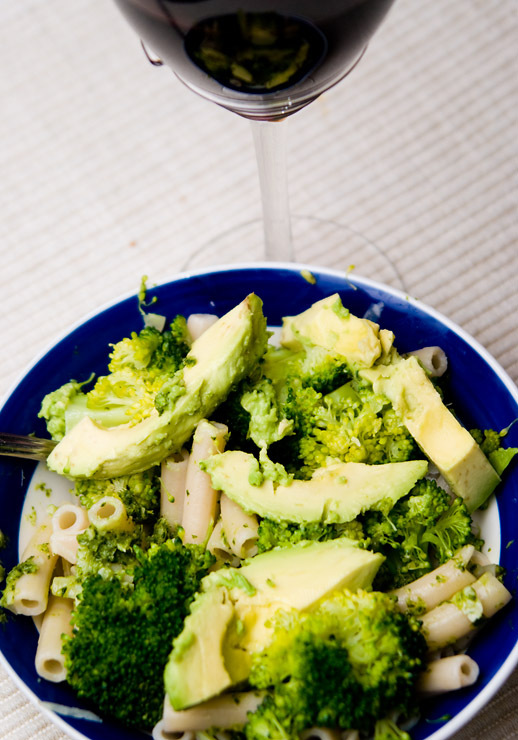 Toss the pasta with the broccoli, sauce, and cheese. Top with avocado slices. Serve immediately. I read this on my RSS feeder, and just thought, “I love Sally.” So I thought I’d let you know. I’m not married to you or anything, but I love you just the same. In the past, I’ve made a similar parsley pesto and served it on bits of baguette — and you’re so right, it is very fresh and “green” tasting. I like it very much and I think it’s great when you step out the basil zone when making pesto. First, I love your blog! Re: depleted energy/exhaustion. If it turns out not to be an iron deficiency, it could potentially be an underactive thyroid. So glad you had a nice Valentine’s Day despite the exhaustion. I hope iron is the answer, because it’s just not like you at all! Who says healthy food has to taste bad, all of these things are delicious on their own even better when put together, I can’t wait to make this.